The United National Party (UNP) yesterday revealed that former President Mahinda Rajapaksa’s family had ordered breakfast worth Rs. 9.4 million from the Hilton and not paid the bill. Former UNP MP Nalin Bandara addressing the ‘expose’ media briefing at Sirikotha claimed that former Secretary to the President Lalith Weeratunga had signed this order instead of ex-President Rajapaksa. 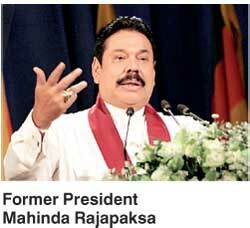 “Former President Rajapaksa and his family have spent Rs. 9,481,502 for a breakfast and they did not pay it back. This bill was dated 1 November 2013. We are wondering about the way they spent public funds for their family needs,” Bandara charged. Bandara further said that the Government had not taken a final decision on whether to pay this bill. “The Government did not come to a conclusion about paying this bill. However we exposed this bill to create awareness among the public of how Rajapaksa and his family misused public funds for their entertainment needs. We will reveal more secret information about the past regime, most of them about fraud and crimes,” he asserted. Bandara also said that anyone could take legal action against the UNP if they could prove these allegations were wrong. “We have written evidences about some major frauds that happened under the past Government. We will expose them one by one. Former President Rajapaksa or anyone can take legal action against the UNP if these are incorrect. They can call us to a debate too. We challenge them to do so,” Bandara said.